Buffet is considered one the most successful investors of the 20th century and has, in the good company of Bill Gates, pledged to give away 99% of his fortune to charity. He is the world's third richest man and CEO and largest shareholder of the multinational conglomerate holding company Berkshire Hathaway. The winner of this year's auction is Andy Chua of Singapore, chairman of AMES United that runs a chain of beauty centers across Asia. 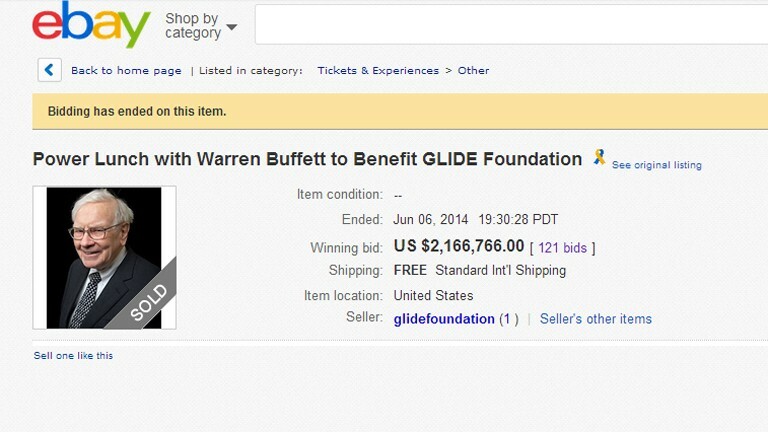 Chua won the bidding on ebay at $2.166.766, the fourth biggest bid in any annual charity auction. The proceeds go to several different organizations, including the Glide Foundation that, throughout the years, has cashed in $16m. The lunch is a fine gesture in terms of the charitable donation but may also be a good investment, Wechsler is now portfolio manager at Berkshire Hathaway.